"Aeolian Traces" is an immersive installation that utilizes a hybridization of data harvesting, physical installation, algorithmic composition and spatial sound. Presented through a multi-channel sound diffusion system and an 8-channel ventilator (DC motor fan) setup, wind currents in the gallery are generated by analysing human migration data. To establish an ephemeral sense of movement around and about the visitor, the ventilators are synced with soft sounds of wind. 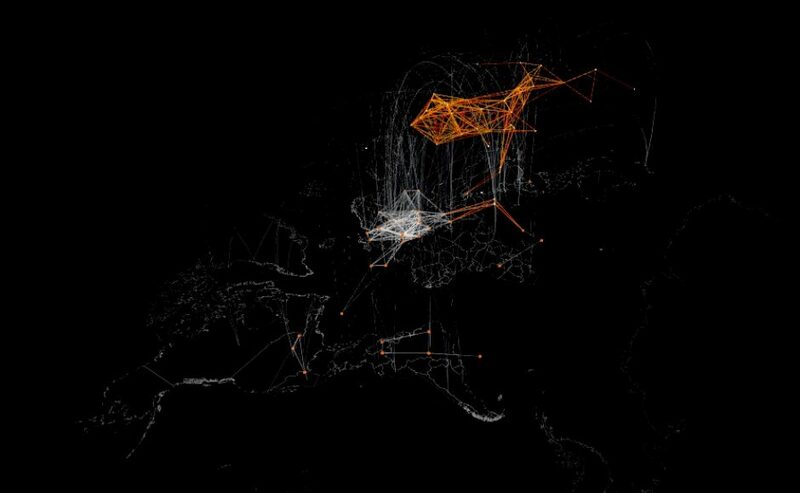 On the screen, migrant populations from a particular country are visualized as nodes moving towards their documented destinations. Sound, image and wind are profoundly connected - the directionality of migration mapped to the movement of all three elements within the Ambisonic sphere. Spoken narratives in native languages are also introduced in the piece as whispers that reveal themselves as they passage from one location to another.